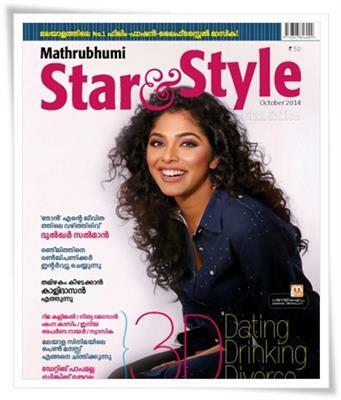 Mathrubhumi Star and Style, the modern life style malayalam magazine known for its majestic mode of delivering content has published the October 2014 issue which features actress Rima Kallingal on cover page. This latest edition of the magazine comes with interesting articles and exclusive photos. If you are ardent or avid follower of latest updated in the film industry, the current issue of 'Star & Style' magazine will deliver the best for you. Being the most popular film and style magazine in malayalam, the content of 'Star & Style' is sufficient to prove the remarks. This highlight of this issue would be the photoshoot and chit chat with actresses Nithya Menon, Aparna Nair, Iniya, Shamna Kazim, Swasika and Devi Ajith. Reports and photos of Kochi Fashion Week are included in the latest edition of the magazine, Interview with Dulquer Salman, Kalidas Jayaram, Ranjith, Renji, Nithya Menon and Rahul Easwar are also featured in this issue. Young actor Dulquer Salmaan who has made his own space in the malayalam film industry opens his heart to the readers. He shares his views about his life, passion and future projects. The reading community would get a rare chance to know the actor much closer than ever. Kalidas Jayaram, the son of actors Jayaram and Parvathy is making his debut as hero through tamil movie. The young hero has dreams about his acting career and a clear vision on his future prospects. The other regular features of this issue include column handled by Mohanlal, Memoirs of Kaloor Dennis, Box Office, Cine News, Marumozhi, Star Jam, New Releases and Star Net, Mix Masala, Hits of September, Marumozhi and much more. The magazine should be praised for its unparallel effort to bring inventive steps in bringing the latest from the film and fashion industry. Mathrubhumi Star and Style is well read by the celebrities and also people from all walks of life. This magazine would fit the interest of youngsters who regularity keeps updated on the latest trends in the film world. So don't miss the latest issue of 'Star & Style' magazine which is truly packed with tons of photos and articles worth for reading.